Our MD Bryan Hindle AIOSH on site at Riber Castle during the structural repairs. As commercial structural repair specialists, we’ve been helping commercial clients with projects across Leeds and Yorkshire for around 3 decades. Bulging retaining walls, cracked floor slabs and slipped arches in stone or brick are a common sight for us. These feature in some of our case studies which you may want to view as an example of our proficiency. Our parent company is Brick-Tie Limited, so of course we are wearing a 30 year old t-shirt when it comes to structural work and wall ties. These are our Commercial pages – if you are a residential or domestic client – please visit our homeowners structural repair section. We’ve worked under the supervision of some of the North’s most demanding and respected main contractors including ISG, Sewell Construction, Strategic Group and Linden Construction. They have high expectations and strict health and safety protocols – that suits us fine because we do too. In addition we are used and trusted by several of Yorkshire’s local authorities and Housing Associations. We’ve worked for The National Trust and The Church’s Conservation Trust too. These organisations need reliable and safe structural repair specialists for cracked walls, bulging masonry and wall ties, who can deliver on promises made; That’s us. Our teams of well trained, asbestos aware, CSCS card holding, safety conscious staff, have worked in Schools, Hospitals, Offices, care homes, sheltered accommodation and retail premises. These projects span the region; from Leeds to Scarborough and Sheffield to Ripon. Commercial structural repair work is little different to our domestic and residential trade work; quality of plastering, masonry repairs, crack stitching, making good and structural works is still high. However it is more demanding, as the environment is often fast-paced and there are deadlines to meet. The scale is usually much bigger too, but even the smallest commercial jobs can be challenging. Credibility and accountability matter a great deal when there is a big project to complete. There may be other contractors working side by side and often dependent on each other. We love this environment and it’s always good to work with like-minded professional builders, architects and engineers. Our Technician Like Dimetrou taking a rest from concrete repairs to the mezzanine soffits. When buildings and structures are on the move, cracking happens. Clients require a fast response and a professional approach. This is why many structural engineers and building surveyors across Yorkshire and the North use our services. A deep understanding of the practical application of remedial structural repair systems is essential. We have the skill levels that professional clients need. Cintec sock anchors offer unrivaled performance and flexibility in stone and rubble fill structures. You’ll find our Cintec anchors in diverse structures such as the historic walls around York, Armley Jail in Leeds, and numerous bridges and retaining walls across Yorkshire. Our Helifix approved engineers are here to help design a remedial structural repair in a cost-effective and efficient, safe manner. All of the ancillary works, such as plastering, stone/brick repairs and any associated building work, can be accommodated. In fact, some of Yorkshire’s best known building contractors and facilities managers turn to us when in need of structural repairs, from crack-stitching to lateral restraint work. Sometimes the work is part of enabling during refurbishment. On other occasions we are reactive, when work on a site reveals unexpected cracks or movement – party wall issues often bring us to the rescue. Over 300M of diamond cored holes were drilled at HMP Armley and Cintec stainless steel anchors installed. Survey services for Commercial Structural Repairs. As recognised structural repair specialists we are asked to assist structural engineers with practical and cost effective solutions to structural problems. Sometimes we are directed by them and merely ‘fine tune’ specifications, based on our expert experience and up to date knowledge. Our surveyors know the practical limitations and the advantages of a wide array of masonry repair methods. This skill comes with years of practiced application of Helifix and Cintec anchor works, as well as the associated masonry repairs. The technicians too, are well versed and practiced, so that together we can bring real value and insight to any structural repair project. Once asked to site we can quickly asses the situation. We’ll try to value engineer the work on your behalf if we can. Saving clients time and money builds on the goodwill we’ve already acquired over the years. It’s why so many professional clients turn to us again and again. We understand the value of this – it’s just one of our incentives to work well for you. Which cracks can be stitched? How many remedial ties will be needed and what type? Can the wall tie density be reduced, based on proof testing our anchors? Is there a better way we can approach a particular repair and still meet or exceed the required performance? Is there a way the work can be done safer? These are questions we ask ourselves daily. Often the positive answer is given to clients, even when they didn’t think of the question beforehand – that is what clients pay a good structural repair specialist for. It’s our job. Our structural repair specialists are trained by us, with help from our valued suppliers; Helifix; Cintec, The Property Care Association, Fosroc and Safeguard – we keep our CPD bang up to date. In fact we also help keep fellow professionals on the ball too, with our regular CPD events and presentations for Architects, Engineers and surveying practices. Many of Yorkshire’s best known and professional structural and civil engineering practices turn to us for this type of work – why not join them? Structural repair specialists and Health and Safety. These day it goes without saying that everyone must embrace the best in promotion and maintenance of excellent health and safety standards. Structural repairs is hazardous activity; dust; noise and manual handling hazards apply to every job we do. Add in the possibility of unstable walls, working at height and aggressive materials and there must be enhanced risk of injury or harm. 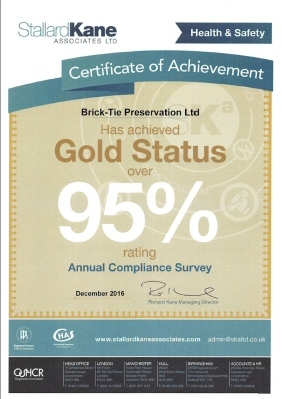 We’ve worked hard to promote a positive health and safety culture in Brick-Tie Preservation. We carry out proactive and reactive monitoring, so we know that this effort is paying huge dividends. It’s making our employees, customers and fellow contractors safer from accidents and from the prospect of poor health in the future. We are a small but growing company, with a full time team of 15 employees. Yet we have a managing director who is qualified to Nebosh construction and general certificate level, our own in house health and safety representative, our own trained manual handling trainer and mask face fit tester too. Health and safety involves everyone in our firm and is everyone’s responsibility. We’ve been commended for our approach by several of our main contractor clients. Our compliance is monitored by our independent consultants Stallard Kane. This year we are delighted to reveal that they were so impressed with our health and safety compliance we were due an award for our efforts and for the second year running we scored over 95% for health and safety compliance. Of course we are also CHAS registered and ConstructionLine registered too. The Construction (design and management) Regulations 2015 places legal duties on commercial clients to: appoint contractors and designers and principal contractor (if more than one contractor is involved) while making sure they have the skills, knowledge, experience and organisational capability to carry out the task safely. We think you’ll be alright choosing us to help you! Still hungry for more details? Have a look at some of the links below – structural repairs and other relevant information for commercial clients is covered; enjoy……. Having structural work or damp proofing done? Let the right one in! Leeds City College. Over 100 years of vibration damage from machinery and traffic. Fixed by Brick-Tie’s dedicated team using Helifix Helibars, Fosroc and Sika concrete repair products and lots of skill.